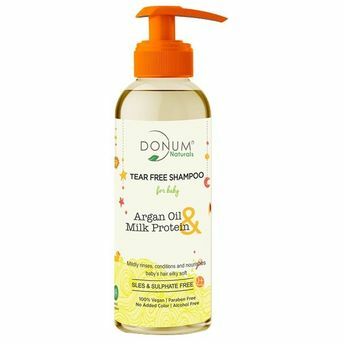 Donum Naturals Tear free range of bath time products are especially formulated with natural vegetable derived and coconut based cleansers that are mild, gentle and doesn't contain sulphates (SLS & SLES), phthalates, or parabens. This tear-free shampoo gently cleanses and soothes baby's hair and scalp which does not cause eye irritation and dryness. A unique blend of extracts helps to hydrate, calm, soothe and disinfect baby's gentle sensitive scalp preventing further dryness that causes scalp infections. Milk Protein and Argan oil extracts promotes healthy hair growth leaving hair soft silky and smooth. It effectively cleanses and rinses, leaving your baby's hair nourished, shiny and manageable. This shampoo is suitable for newborns and for kids upto 10 year olds. It is important to stop using chemical based or sulphate based shampoos for children as they are very harmful and do further damage rather than benefitting your little one.